Ancient Chompers Were Healthier Than Ours : Shots - Health News By examining ancient dental plaque, researchers have concluded that prehistoric humans' diets made for healthier mouths. The addition of flour and sugar to modern diets may have set the stage for a near-constant state of oral disease. This skull may have better teeth than you. Prehistoric humans didn't have toothbrushes. They didn't have floss or toothpaste, and they certainly didn't have Listerine. Yet somehow, their mouths were a lot healthier than ours are today. 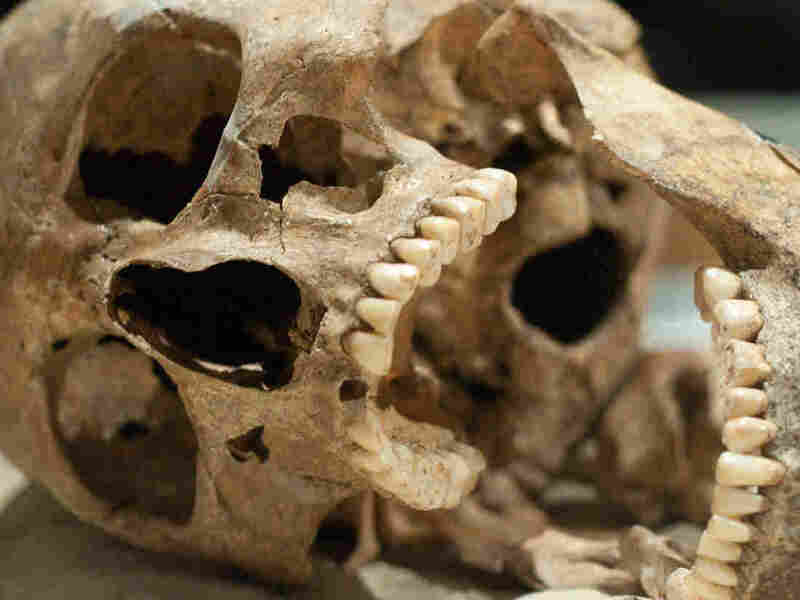 And thousands of years later, we're still waging, and often losing, our war against oral disease. Our changing diets are largely to blame. In a study published in the latest Nature Genetics, Cooper and his research team looked at calcified plaque on ancient teeth from 34 prehistoric human skeletons. What they found was that as our diets changed over time — shifting from meat, vegetables and nuts to carbohydrates and sugar — so too did the composition of bacteria in our mouths. Not all oral bacteria are bad. In fact, many of these microbes help us by protecting against more dangerous pathogens. However, the researchers found that as prehistoric humans transitioned from hunting and gathering to farming, certain types of disease-causing bacteria that were particularly efficient at using carbohydrates started to win out over other types of "friendly" bacteria in human mouths. The addition of processed flour and sugar during the Industrial Revolution only made matters worse. "What you've really created is an ecosystem which is very low in diversity and full of opportunistic pathogens that have jumped in to utilize the resources which are now free," Cooper says. And that's a problem, because the dominance of harmful bacteria means that our mouths are basically in a constant state of disease. "You're walking around with a permanent immune response, which is not a good thing," says Cooper. "It causes problems all over the place." In addition to oral disease, those problems may include diabetes, obesity and even heart disease. According to Cooper, bacteria make up approximately 90 percent of the cells in our bodies. He believes that we focus too much on ourselves and not enough on this so-called microbiome. "We brush our teeth and we floss, and we think that we've got good oral hygiene. But [we're] completely failing to deal with the underlying problem," he says. "Ten years from now, I think we're going to find that the whole microbiome is a key part of what you get monitored for and treated for." As for right now, Cooper suggests that one way to help return your microbiome to a healthier, more balanced state might be to cut out all of those processed carbs and start eating like our ancestors. Sounds like he's another fan of the paleo diet.